If you’ve got an older toilet, you’re probably paying for twice the water you need for each flush. But never fear: toilet replacement is usually a simple job for the do-it-yourselfer with basic skills. First, close the water supply valve, flush, bail and use a sponge to completely empty the toilet and tank. Uncap and remove the nuts from the base of the toilet, then detach the water supply line, starting with the tank end. If your toilet is a real antique, you may need to unbolt the tank from the bowl. Get a little help to lift the old toilet off its bolts. Check that the waste line is still attached to the floor flange, and repair any water damage to the subfloor. Clean out the remains of the old wax ring. 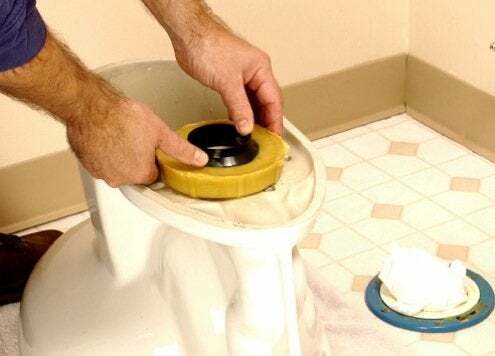 Don’t scrimp on a new one, because that wax ring is what seals and stabilizes your toilet. Then follow the manufacturer’s instructions to install your new toilet and start lowering your water bill!